With its mouth wide open this Atlantic Salmon fish monument symbolizes Campbellton, New Brunswick as being the capital of the salmon country. A large fish monument standing 8.5 meters high is a replica of an Atlantic Salmon and adorns the waterfront in the town of Campbellton, New Brunswick and was even named Restigouche Sam. Campbellton is the capital of salmon fishing and sports addicts travel for miles to fish in these waters trying to catch the largest Atlantic Salmon. 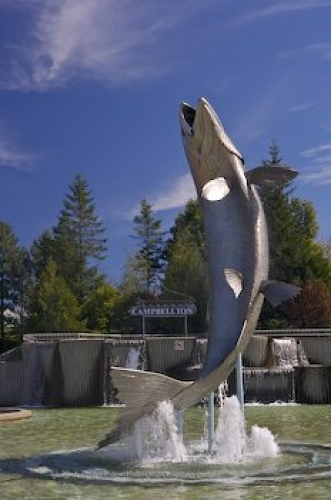 Picture of a fish monument representing an Atlantic Salmon in Campbellton, New Brunswick.